If you can't make it to Blizzcon in person this year, you can still watch the festivities with a Virtual Ticket. Blizzcon tickets went on sale back in April, and like every other year, they sold out almost instantly. But if you really want to be in the crowd as Blizzard celebrates its 25th anniversary (and the 10th Blizzcon), you can still do that - you'll just have to do it digitally. 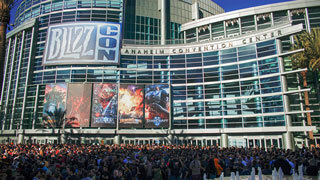 Blizzcon's Virtual Ticket went on sale yesterday. These tickets allow you to stream the panels, esports events, interviews and closing ceremony from wherever you are, and they cost $39.99. You watch the event as it happens, and you can also return to watch all of the video on-demand for three weeks after the convention is over. Not only does the Virtual Ticket get access to watch the show, it also includes a bag of virtual goodies for all Blizzard games. The exact contents have not been announced yet, but you'll typically find unique Blizzcon-only skins, items, and the like. Purchasing a Virtual Ticket will also entitle you to pre-purchase a Blizzcon Goody Bag full of physical items as well, although these will sell out fast. A Virtual Ticket will run you $39.99, and they can be purchased from this Battle.net page.